Selfie Sticks have gone through a lot of public turmoil in the last few years. It all started last year, where a lot of selfie sticks started appearing, much like the word selfie. However, much like the slow uptake of the word selfie itself, selfie sticks have suffered a lot of bad press, with people generally claiming that they would rather not be seen with one. However, as 2014 has rolled into 2015, selfie sticks have become a normality, and they are just another way of spotting a group of teenagers, or tourists. However, they have their uses, as I have often used them as a tripod, or take videos and photos to hold my phone or other device steadily. Normally selfie sticks look dull, and often need a Bluetooth connection, and hence the whole formality of pairing and being stuck to one particular device to work. 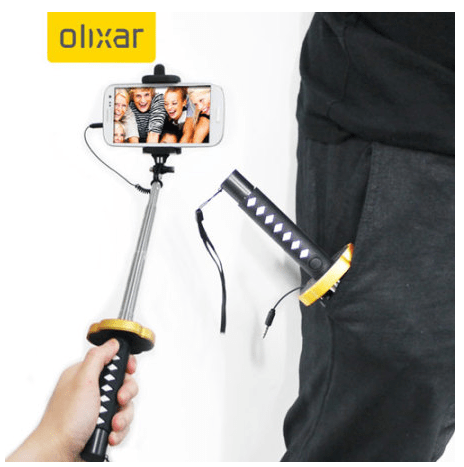 The Olixar Ninja Katana Selfie Stick bucks the rend. Not only does it use the headset socket on mobile phones to allow users to hit the shutter button, but more importantly, it makes it look like a ninja sword, making it not just a useful gadget, but also a good looking one, and most importantly, not an embarrassing one. The handle on the bottom is, as already mentioned, designed like that of a sword. The top of it includes a button that can be pressed to take a photo. While it isn’t metallic and heavy like that of a sword, and more of the plastic type, it still looks and feels good, and there is no element of cheapness. The button itself has a good feel too. On top is a retractable attachment that can be expanded up to half a meter, in which most phones can be attached, using a retractable attachment. I have tried attaching big phones like the Huawei Mate S or the iPhone 6 Plus, down to small ones like the Moto G, and they all fit in well. Once in, the phone stays in, and doesn’t really budge. The same goes for extraction and contraction. It stays where you leave it, and doesn’t stretch and close due to weight. It works with Android, iPhones and Windows phones. You simply plug the 3.5mm cable into your phone’s headset socket, open the camera app, and press the button to take the phone. The joy of this is that you don’t need any Bluetooth or batteries to make this work, which makes this automatically better than anything else out there. The look makes it great too. Fun, practical and convenient, can’t fault this at all! Previous story Comedy in Oxford, a tough gig?